This is my first post here. I just started learning a few basics about the Egyptian language - Coptic stage. As a newbie, I've a simple question. Sometimes I see "ⲉϥ" between brackets after some words in the dictionary. If I remember correctly, those were adjectives (correct me if I'm wrong). So my question is when I see "(ⲉϥ)" after a word, does that mean that the prefix "ⲉϥ" is optional? So yes, for ⲟⲣϥ (To be enclosed) addingⲉϥ will make it ⲉϥⲟⲣϥ (enclosed). I don't know the meaning of ⲑⲏⲕ or ⲟⲣϣ, they don't exist in crum (most reliable Coptic dictionary). So are you implying that the prefix "ⲉϥ" is added to some verbs to create adjectives? For me Crum is harder to browse than Mo'awad Dawoud, and the simplified version does not include enough vocabulary. 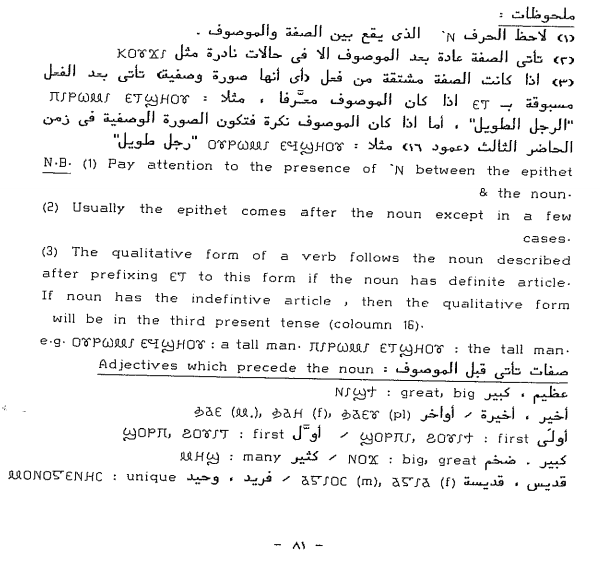 A problem with Mo'awad Dawoud's dictionary (at least the online version) that it did not include a page with the list of abbreviations like most dictionaries do. To summarize, some (but not all) adjectives are created by adding a pronoun (Present III) to the verb. Therefore the dictionary abbreviation "(ⲉϥ)" means that the word needs to be conjugated in order to form a proper adjective. Please correct me if I am wrong. I also found this in p. 81 of "Let us read and speak the coptic language" 3Ed. for Kamal Isaac. I have never used Moawad's dictionary before so I can't confirm that with 100% certainty. we came to this conclusion based on the two words you mentioned in your example above.